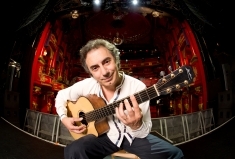 Back in 1974, Pierre Bensusan (www.pierrebensusan.com) was cutting his teeth as a performer on the folk scene in Paris and other cities in France when one of his idols, banjo great Bill Keith, offered him his first official paying gig ever touring Western Europe with his bluegrass band. The French-Algerian upstart, humbly launching a four decade career which would earn him worldwide renown as the “Mozart of Guitar,” was hired to play mandolin. But when Keith heard his groundbreaking approach to the acoustic guitar, he decided to allow Bensusan a few key spotlights on that instrument. Decades later, when Bensusan was looking for potential finishing touches for Encore, his ambitious and expansive retrospective collection celebrating 40 years as a globetrotting live performer, he discovered a reel to reel tape with a Swiss National Radio recording of a concert in Lausanne from that tour. While the tireless troubadour’s original plan for the 3-CD set was to include tracks recorded between 1998 and 2013 in France, Canada, Ireland, Austria and especially the U.S. (where he regularly records), Bensusan decided to round out the 35-track set by starting “Disc 2” with a set of five titles from this show, including two bluegrass songs. Engineered in Los Angeles by two-time Grammy nominee Rich Breen, Encore also includes a handful of songs featuring Bensusan’s beautiful French language vocals (“Cordilliere” and “Pas Sage,” among others) and wordless vocalese (“Bamboul’hiver”); two cuts with future Dream Theater keyboardist Jordan Rudess from a commissioned 1998 concert in Northern France that included a 200-piece children’s choir (including the previously unreleased “Anthem For The Ocean”); and the 18-minute setpiece “Celtic Medley.” In all, Encore features 11 tracks never previously released commercially in any form. Thousands of his fans own these recordings but anyone who has experienced him in concert knows that the guitarist’s greatest range of expression and vast emotional depth comes in the joyful and spontaneous, risk taking moments during his live performances. And that some of his greatest studio work originated during onstage bursts of spontaneous improvisation. Despite headlining over 3000 shows throughout North America, Europe, Asia, Australia and Africa since the mid-‘70s, his only live performance releases have been a DVD of a live concert in San Francisco in 1996 and a dual CD of a concert in Paris with French woodwind player Didier Malherbe, Live in Paris (1997). Bensusan’s lifelong friend and collaborator, master luthier George Lowden, has also begun work on a special 40th Anniversary Bensusan signature model guitar which is due for release in January 2014. The signature guitar celebrates both Pierre and George’s 40th career anniversaries, a span of time over which Pierre has taken his trusty Lowden guitar (loving referred to as his ‘old lady’) to all the corners of the globe. His ‘old lady’ was put into retirement in early 2000 when Pierre’s new signature model was built, a model which went on to become Lowden’s best-selling signature guitar. Lowden guitars will be teaming up to support Pierre’s 40th Anniversary World tour, covering Belgium, Germany, Switzerland, Paris, London, Tel Aviv, Jerusalem, North America and Europe (Germany, England and Ireland) before a fall 2014 jaunt that takes him to numerous Asian markets, including China, South Korea, Singapore, Taiwan and Japan.